Join Downeast Maine’s own Acadian fiddler Gus La Casse in one of his final area shows before he heads off to college. Enjoy an evening of lively kitchen party fun! The Order of Good Cheers (L’Ordre de Bon Temps) was originally a French Colonial order founded by suggestion of Samuel de Champlain upon arrival in New France, present day Nova Scotia, Canada. Champlain encouraged his men to hold regular dinners as an antidote to their difficult conditions. It is said he laid the foundations for the hospitality and music you’ll still find all along the Acadian coast and at Acadian kitchen parties. Come join fiddler Gus La Casse as he keeps the tradition alive playing lively bold tunes that embody the Acadian kitchen party feeling. This will be one of Gus’ final area performances before he heads off to college and it’s sure to be a fun night! 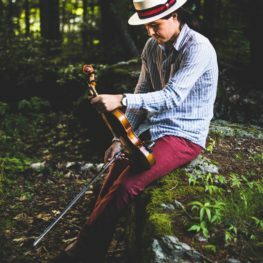 Described as a “passionate and masterful player who values tradition…” Gus La Casse is exploring the future of fiddle music. Gus’ repertoire reflects his innovative spirit and dedication to the Cape Breton and Acadian fiddle traditions, playing both standards of the genre and his original material. Based in Downeast Maine, Gus maintains an active performance schedule as a solo artist. Gus’ music has also taken him beyond Maine. He was the 2014 student in residence at the Acadia School of Traditional Music, appearing on the Canadian international television broadcast from the Congrès Mondial Acadien 2014. He traveled to Ireland as part of the Young Tradition Vermont touring group in 2016, and has enjoyed playing the legendary Club Passim in Cambridge, MA. In 2018, Gus was a featured performer at the American Folk Festival in Bangor, Maine.